The rich history of Caddo Lake stretches back many centuries, the diverse natural habitat playing host to myriad plants and wildlife. And, as Caddo Indians discovered in the 18th and 19th centuries, the region’s wetlands, forests, and floodplains provided bountiful opportunities for hunting and foraging. Beginning with a small plot of donated parkland in 1927, the state in 1929 and 1931 designated the entire lakebed as state parkland. From its freshwater marshes, backwater swamps, and majestic moss-festooned bald cypress, Caddo Lake provided plenty of inspiration for CCC enrollees in Companies 889 and 857 in the 1930s who proceeded to construct landscape-friendly structures. The park roads at Caddo were planned by National Park Service-funded designers and landscape architects, notably Joe W. Westbrook and Fred R. Carpenter, who the State Parks Board employed; CCC enrollees implemented their designs. The concession building and guest cabins were likewise collaborations. The park-building partners of the U.S. Army, State Parks Board, NPS, and CCC undertook an experiment as work at the park drew to a close: converting the temporary barracks and mess hall to park facilities that would allow long-term use. The resulting structures—nine large cabins and a recreation hall, improved with pine, oak, and hickory harvested from the area's upland forest and plenty of native iron ore for the foundations, walls, and fireplaces--harmonize with the natural landscape. 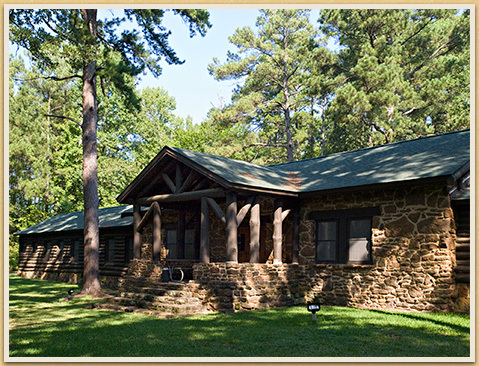 Portals, Park Road 2, Horse and Foot Trails, Shelter House, Boat House, Nine Cabins, Concession Building (currently the group recreation hall), Picnic Sites, Culverts, Vehicle Bridges, and Well House. The Pavilion, Latrines, and some picnic facilities are no longer in use. Lookout Towers and Firebreaks were designed but not constructed.